Cosy three bedroom farm cottage set in the most beautiful peaceful location with breath-taking views. 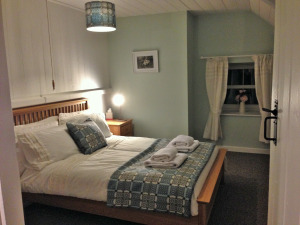 Ideal for a romantic break or a family holiday. Situated near the peaceful village of Llangwyryfon, it is an ideal base for you to explore one of the most picturesque parts of Ceredigion, a haven for walkers, birdwatchers and cyclists. Pets welcome, but not to be left unsupervised. Ample private parking. Free welcome package on arrival. We cater for everyone, so whether it's a short weekend break, a mid-week break or a full week you are looking for, we will be happy to help! Double bedroom with 'Melin Tregwynt' throws, television and DVD player. By car (from Aberystwyth): Take the A487 from Aberystwyth towards Cardigan for approx 2 miles. In Llanfarian, turn left onto A485 and proceed for 1.4 miles. Turn right onto B4576 and drive for 4 miles until you come in to the village of Llangwyryfon. By the village shop turn left towards Trefenter, drive for 1 mile, then turn left again for Lledrod. Drive for half a mile, we are the third place on the left. SY23 4SR!